In one minute and 29 seconds, Platinum Games have managed to pretty much erase Michael Bay's awful Transformers films from my mind. I'm unlikely to ever play their latest fast-paced beat-'em-up, but it's wonderful to see the Transformers once again depicted as the colourful, silly cartoon robot people we knew them as in the 1980s. See Optimus Prime and friends have some big robo-scraps with their deadly enemies the Autobots in the above trailer, then wonder to yourself whether Platinum's game will be any better than The Legend of Korra. 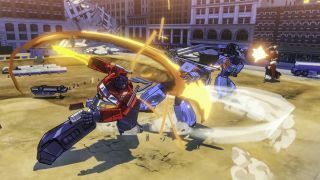 Transformers: Devastation is out later this year.